A Federal High Court in Lagos on Thursday struck out a suit filed by the 19 All Progressives Congress (APC) lawmakers, challenging the removal of the Speaker of the State House of Assembly, Adewale Omirin, and his deputy, Adesegun Orisalade. Justice Saliu Saidu, who gave the ruling, awarded a cost of N100, 000 against Mr. Omirin and 18 other lawmakers. The judge struck out the suit after listening to the submission of the counsel to the APC lawmakers, Norrison Quackers, represented by Onyeka Ofoegbu. He had urged the court to strike out the suit without cost. Counsel to the defendants, Kayode Olufala, urged the court to dismiss the plaintiffs’ suit with a substantial cost. The Peoples Democratic Party, PDP, lawmakers, while urging the court to dismiss plaintiffs’ suit, supported their application with the provisions of Order 15 Rule 2 (1) of the Federal High Court Civil Procedure Rules. Mr. Saidu said: “I have gone through the notice of discountenance and objection filed by the defendants, urging the court to dismiss the plaintiffs’ suit. “The defendants have taken steps in this case by the processes they filed, saying this case ought to be dismissed and not struck out. “The issue in a situation like this where the defendants have taken steps is left at the discretion of the court in the case of Rear Admiral Ebi Borpeni Vs Darabella Nigeria Ltd; 2014. “However, this issue has been well discussed in the case of Abayomi Babatunde Vs Pan Atlantic Shipping and Transport Agency Ltd and others where the court was urged not to close the door of justice. “In the present democratic setting in this country, I am cautioned to take the path of striking out the case rather than dismissal. The APC lawmakers had challenged the removal of Omirin and his deputy. The suit which was filed in December 2014, was seeking, among others, an order restraining the factional Speaker of the House, Dele Olugbemi, and his deputy, Olayinka Abeni, from either parading themselves as or executing duties in the capacity of the leaders of the House. But the lawmakers, through their counsel, Quakers (SAN), had on April 9, filed a notice dated April 7 to discontinue the case. 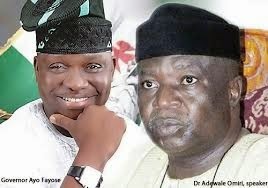 Though no reason was given in the notice of discontinuance of the suit, the action followed the argument by Fayose that Omirin and Orisalade lacked the locus standi to commence any impeachment proceedings against him since they had been impeached and were currently challenging their impeachment in court. The defendants in the suit are Olugbemi, Samuel Ajibola, Adeojo Alexander, Adeloye Adeyinka, Isreal Olowo Ajiboye, Fatunbi Olajide, and Olayinka Abeni. Others are: Gov. Ayodele Fayose, the Department of State Security, (DSS), the Inspector General of Police, Ekiti State Commissioner of Police, Owoseni Ajayi, Kayode Oso, and Toyin Ojo (nine to fourteen defendants respectively).